683 pages | 340 Color Illus. 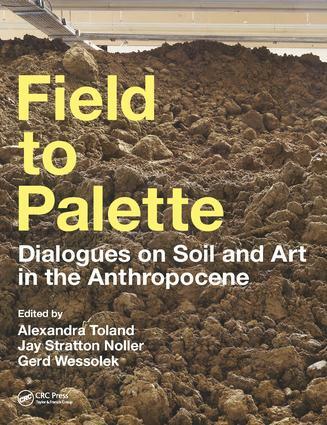 The ambition of the editors and contributors of the book Field to Palette: Dialogues on Soil and Art in the Anthropocene is to help society reconnect with soil. The chapters are either essays that explore some of the cultural articulations of soil or incredibly informative conversations between artists, activists and scientists who share their thoughts about the material properties, cultural histories, environmental functions and existential threats of soil. Field to Palette is an amazing publication. Its almost 700 pages are packed with photos, surprising information and moving encounters. I wish i had the time to talk about everything i’ve learnt in the book. The unexpectedly sophisticated sensory abilities of nematodes or the method to turn plastic-free baby diapers into planters and nutrients for trees, for example. Since one of the greatest achievements of the book is the way it demonstrates the important role that artists can play in raising discussions with the public and in participating to the solution to the many challenges soil faces today, i’ll dedicate the rest of my review of the book to just a few of the artworks and stories i discovered in Field to Palette. 1. Urban Farming: The New Green Revolution? continues to write and make artwork about soil. audiences through presentations, exhibitions, and soil art projects.